1 of 4 Heat oven to 500 degrees F. Coat a 15 x 10 x 1-inch baking pan with nonstick cooking spray. 2 of 4 On a lightly floured surface, roll dough into a 15 x 10-inch rectangle. Gently roll up onto a lightly floured rolling pin and unroll onto prepared pan. Push dough into corners. 3 of 4 Spread sauce evenly over dough to within 1/2 inch of edge. Sprinkle oregano over sauce. Scatter cheese over top. 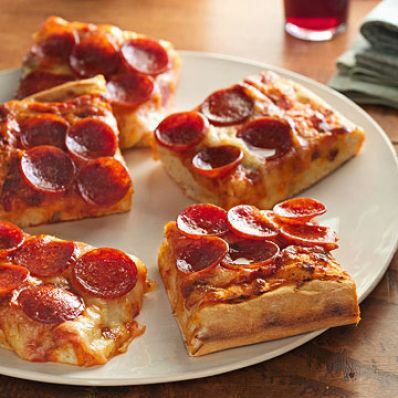 Place pepperoni slices over cheese. Bake at 500 degrees F for 18 to 20 minutes or until nicely browned on bottom. Remove from oven. 4 of 4 Cool slightly and cut into 12 slices; serve. Per Serving: 255 kcal cal., 10 g pro., 582 mg sodium, 1 g fiber, 4 g sat. fat, 10 g Fat, total, 21 mg chol., 35 g carb.